At CLIMB Works, we want all our guests to have an incredible experience, whether they are trying our mountain biking experience or one of our zipline tours. If you have never been ziplining with us before, you might be wondering what to expect on your adventure. 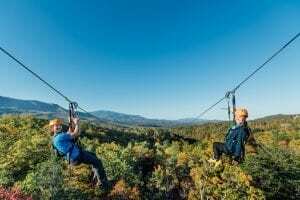 To help you prepare for the best time, we’ve put together some of the most important dos and don’ts of ziplining in the Smoky Mountains. If you follow those, you’re sure to have a great time! 1. Don’t get too caught up taking pictures. When you go ziplining in the Smoky Mountains, you can expect to see breathtaking scenery everywhere you look. While we do allow you to bring a camera if it is secured somehow, be sure not to get too caught up taking pictures that you forget to actually take in the experience with your own eyes. We understand you want photos to remind you of your fun adventures, which is why we take pictures of you ziplining that you can purchase from our office! Don’t spend your time worrying about what the weather is going to do while you’re ziplining. We operate rain or shine! The Smoky Mountain ecosystem comes alive when it rains, making your experience even more exciting. We recommend that you dress appropriately for the weather and are always prepared for rain to come and go. We even have ponchos available upon request! You might get a little wet but it’ll be an experience you won’t forget. 3. Don’t let fear get the best of you. One of the most important things to keep in mind is not to let your fear get the best of you. It’s OK to be afraid of heights or just nervous in general if it’s your first time ziplining in the Smoky Mountains, but if you spend the whole time focusing on that fear, you won’t be able to have as much fun! Our trained staff helps you from start to finish, from taking care of all necessary safety operations to making you laugh and feel more comfortable. 4. Don’t wear the wrong clothing. This don’t seems obvious, but many people wonder what they should wear for their zipline adventure. Wearing something that makes you feel uncomfortable can negatively impact your experience. We recommend wearing comfortable clothes that you don’t mind getting a little wet in case it rains. Short shorts, dresses, skirts and baggy clothes are not recommended. Of course the most important thing is for you to enjoy yourself! Whether you try our Treetop Canopy Tour or Mountaintop Zipline Tour, you’re in for a fun-filled adventure that includes an ATV ride, sky bridges, spectacular sights and more. Since your safety is in good hands with us at CLIMB Works, the only thing you have to focus on is having fun! 2. Do make a reservation. While reservations are not required, we do recommend that you make one. The only way to guarantee you will be able to zipline at the time you arrive is if you make a reservation in advance! We do our best to accommodate walk-ins, but we cannot promise we will have any openings. During busy seasons, try to make your reservation at least 5 days in advance to ensure that you can get your preferred time. 3. Do share it with the ones you love. Everything is even more special when you share it with the ones you love. That’s why families and friends love ziplining together at CLIMB Works! You will be able to create memories together that last a lifetime. If you try our Mountaintop Zipline Tour, you get to ride side-by-side the person of your choice on our 6 dual lines! 4. Do take in the experience. Do be sure that you take in the experience. Ziplining with CLIMB Works is an unforgettable adventure, and we want to be sure that you leave feeling happy and accomplished. Our mission at CLIMB Works is to encourage everyone to push themselves outside of their comfort zone in a safe and controlled environment. We want you to end the day feeling inspired to try new things and with the confidence that you can overcome any fear. Now that you know what and what not to do when you go ziplining in the Smoky Mountains, it’s time to plan your adventure! 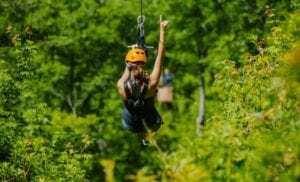 Learn more about ziplining with CLIMB Works, then plan your trip.